My husband said I would never do it, so of course I immediately called my hair stylist, who is now my colorist, and told her I wanted a streak of color in my hair. She thought we needed more than a streak and I agreed. 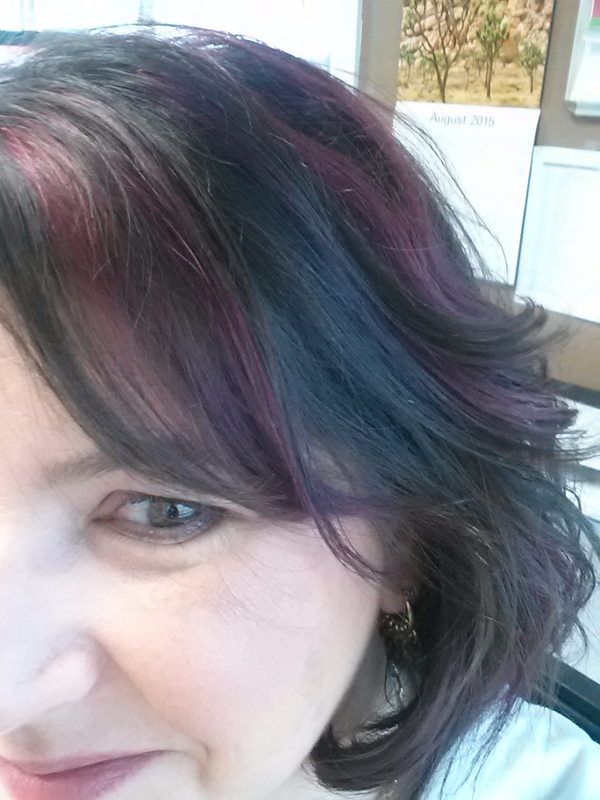 Apparently when the gauntlet is thrown down, I don’t procrastinate because just a few days later, I walked out of the salon with magenta highlights. I love it so much I can hardly stand it. I LOVE IT!!! SO stinking cute. Middle age, shmiddle age I say. Looks great. Very cute! I love it!!! I’m a sandy brown color and fortunately, the gray hair won’t come in until I’m at least 50, if genetics has anything to do with it. Until then, I’ll continue to highlight. Good for you! I love it! Magenta!!! Beautiful! Clever husband to manipulate you into doing what he wanted. Way to not go gentle into that good night. I like it! It looks like your hair, eyes, and lipstick are all coordinated! Looks amazing!! Great, bold, choice!